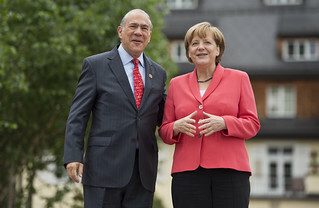 Mr. Angel Gurría, Secretary-General of the OECD, attended the G7 Summit in Schloss Elmau on 8 June 2015, at the invitation of Ms. Angela Merkel, Federal Chancellor of the Federal Republic of Germany. He participated, alongside G7 partners, African Leaders and Heads of IGOs, in working sessions on the Development Agenda. Find out more about the main achievements and OECD contributions. 8 June 2015 - Angela Merkel, Federal Chancellor of Germany and Angel Gurría, Secretary-General of the OECD, at the G7 Summit in Schloss Elmau.